This is a Korean dish that we have been enjoying for breakfast lately. My husband usually has the pleasure of making it and I eat it promptly without thinking of taking a picture first, so I have to link to other bloggers for photos. We use brown rice, shredded carrots, spinach, bean sprouts, corn and ground chicken and eggs to make our bibimbap, but you can add whatever you want and it will taste good in my opinion. 🙂 We like to use lots of gochujang, which is a Korean Red Pepper paste. 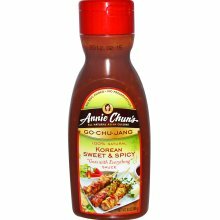 Sunchang makes a good Gochujang paste and Annie Chun’s also has a milder sauce that is readily available in stores.